The technicians at Nicolás Correa Service, S.A. have completed the complex installation and commissioning of the CORREA SUPRA 120 CAC milling machine, following its sale in spring 2015 to a Spanish company specialising in the machining of high precision parts, primarily for the aviation, marine and machine tool sectors. This SUPRA model incorporates latest generation technologies, making it a reference point within the range of CORREA travelling column milling machines, offering users excellent versatility accompanied by high dynamic performance. Furthermore, it has great potential for roughing and finishing work whilst it can deliver superb precision for work on complex parts. 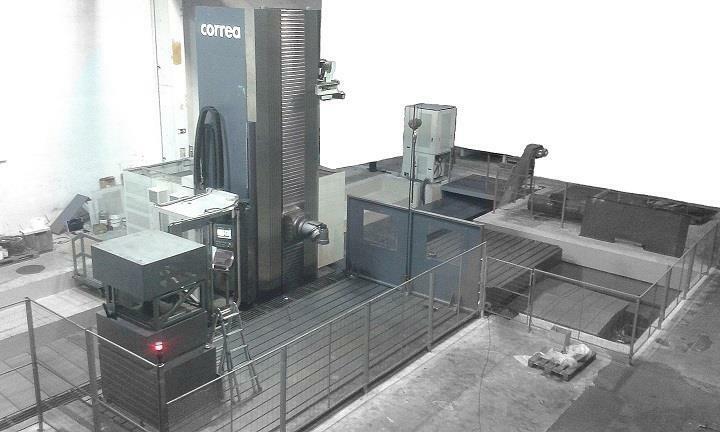 This CORREA SUPRA 120 CAC milling machine, manufactured in 2008, is fitted as standard with a latest generation Heidenhain control (iTNC-530), linear guides on the X-Y-Z axes, Y axis roller pack system on tempered steel races, ram drop compensation system, ram saddle rocking dynamic compensation, operator platform and perimeter fence. One of its most important features is its large capacity, primarily in the Z axis where this machine has a vertical travel of 4,000 mm, as well as a longitudinal travel on the X axis of 12,000 mm and a cross travel on the Y axis of 1,500 mm, making it suitable for a wide range of applications. With regard to accessories, particular mention should be made of the Demmeler DRTLTS2500 high capacity divider plate (4,000 x 3,000 mm) with a travel of 2,000 mm and loading capacity of up to 60 ton, ideal for machining large work pieces. It also features a universal auto-indexing head (UAD, resolution 0.1º) with coolant through the spindle, an automatic head changer and 60-post automatic tool changer. The transport, installation and commissioning processes for a milling machine of this size, are highly complex. However, thanks to the extensive knowledge and experience of the NC Service technicians, all processes were successfully performed to the complete satisfaction of the end customer. For the smooth implementation of this work, NC Service was required to direct and co-ordinate all the many different factors involved. Firstly, the prior foundation work needed to be approved, in order to ensure the perfect precision of the subsequent machining work. The organisation of the transport and unloading of the 8 trucks necessary to move all the machine parts to the customer´s premises was also a key factor in the commissioning process, in addition to the precision in the handling and installation of the largest components such as the 4m high column, or the roto-traversing table with a 60 ton capacity. Finally, the necessary protocols were completed in order to guarantee the perfect operation, machining precision and geometry of this milling machine. The primary focus of NC Service during the installation of this machine was to guarantee complete reliability of performance, thereby ensuring end customer satisfaction and confidence. With this CORREA SUPRA 120 CAC the customer can achieve excellent precision in the machining of complex parts and now has an increased possibility of obtaining major new work projects.